Find artisanal vendors, maple taffy, roasted chestnuts, carollers and more at U of T Scarborough’s third annual Christmas in the Valley. Fall in love all over again with classic rock songs at B-Side: A Rock Cabaret, performed live by the UC Follies. Floating and Flying is the name of this wind ensemble concert conducted by Gillian MacKay, a professor at U of T's Faculty of Music, with 2017-18 Wind Concerto Competition co-winners, students Jonathan Wong and Jason Han. The performance also features a guest ensemble from Queen’s University. Classical and contemporary pieces will be performed at U of T Scarborough’s Fall Flourish Music Concert featuring their concert choir, concert band and string orchestra. Listen to the student-run Hart House Chamber Strings perform at their winter concert conducted by musical director Keith Reid. Ahead of the National Day of Remembrance & Action on Violence Against Women, U of T’s Factor-Inwentash Faculty of Social Work is hosting an event commemorating the lives lost at the 1989 shooting at l’École Polytechnique de Montréal. Re/Figuration: Digital Tactics 4 Digital Colonialism is a talk by media artist, activist and educator Morehshin Allahyari. It is part of the McLuhan Monday Night Seminars that carry on Marshall McLuhan’s work. Students, staff and faculty are invited to remember the lives lost to gender-based violence at an event with U of T Mississauga’s Sexual Violence Prevention & Support Centre and the Equity & Diversity Office. 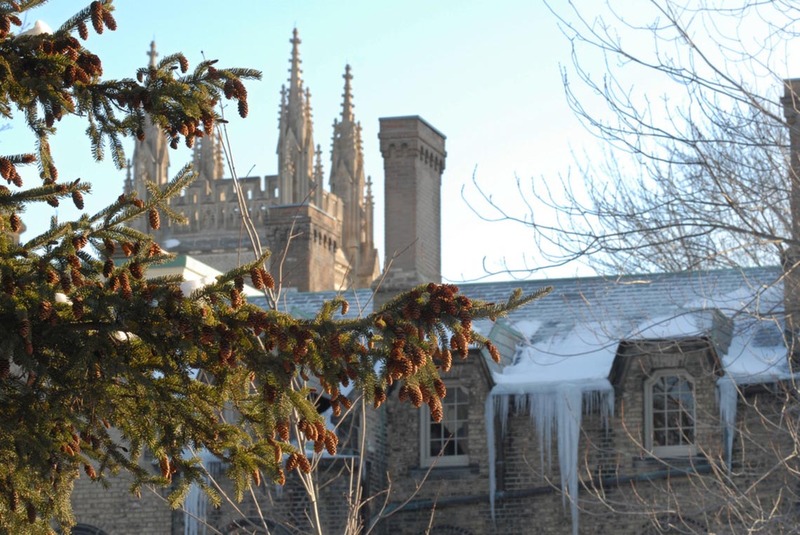 Listen to songs of the season performed by the vocal studies department at U of T as part of the Faculty of Music’s Tuesday Noon Series at Walter Hall on the downtown Toronto campus. An event honouring the women of the l'École Polytechnique attack occurs on the downtown campus today, including the presentation of awards to recognize research that addresses gender-based violence. Today is the last day of Food for Fines. U of T Libraries will waive $2 for each non-perishable food item, with up to $20 waived. No fines? You can still participate. Donations go to the U of T Food and Clothing Bank, which is open to U of T students. Bring your items to the U of T Mississauga Library, U of T Scarborough Library, and select libraries on the downtown Toronto campus – find the full list online. Jazz, pop and R&B are all part of today’s performance by Onoscatopoeia, the Hart House Jazz Choir. Listen to this a capella ensemble for free, or pay what you can. It's Friday, which means another Free Friday Film at Innis Town Hall, part of the Cinema Studies Student Union’s programming. Watch some cult classics, including The Wiz today and Suspiria next week. Today is your last chance to visit the I continue to shape exhibition at the University of Toronto Art Centre. This is also the last day to see the winning submissions of the 16th annual BMO 1st Art! Competition at the Justina M. Barnicke Gallery, with work by 13 artists, each from a different province or territory. Explore U of T’s entrepreneurship ecosystem with the Entrepreneurship Hatchery’s weekly Idea Markets in the Myhal Centre. Students are encouraged to join the Hatchery community. Enjoy seasonal foods with Winter Cheer, a festive prix fixe lunch at Hart House’s Gallery Grill happening today and tomorrow. Watch one-act plays about love, growing up and more, created and produced by students at U of T Mississauga’s Beck Theatre Creation Festival, running from today to Dec. 16. Pay what you can. Giizhiitaa – Coming Full Circle, is a multimedia showcase by Peel Indigenous youth, celebrating their achievements in U of T Mississauga’s Indigenous Spirit Journey program. The event features reflections by Elders and knowledge keepers, as well as a light Indigenous buffet. Meet some U of T Scarborough leaders and community members at December Community Day, wrapping gifts with the East Scarborough Boys and Girls Club. Don’t forget to use your gym membership. There are still lots of fun drop-in fitness classes this month. Some classes at U of T Scarborough today include rock climbing, Zumba, and yoga. There are also drop-in classes at U of T Mississauga, including Cycle-Barre Fusion today. U of T students paying incidental fees have access to facilities across all three campuses. Join the Hart House Chess Club for their last open chess play of the year – open to everyone, from beginners learning the basics to seasoned competitors looking improve their game. Play casual chess with friends, old and new, in this friendly and open environment.